Kyoto, Japan’s Otoboke Beaver is musically in the business of taking no prisoners. The feminist punk quartet has taken that concept one step further with a riveting Russ Meyer-meets-Tarantino video calling card for “Love Is Short,” the title cut of their latest EP. Treading a fine line between incisive and unhinged, Otoboke Beaver rarely sticks to the beaten path, conjuring up a maelstrom that needs no translation. While their debut LP, 2016’s Okoshiyasu!! Otoboke Beaver (Welcome!! 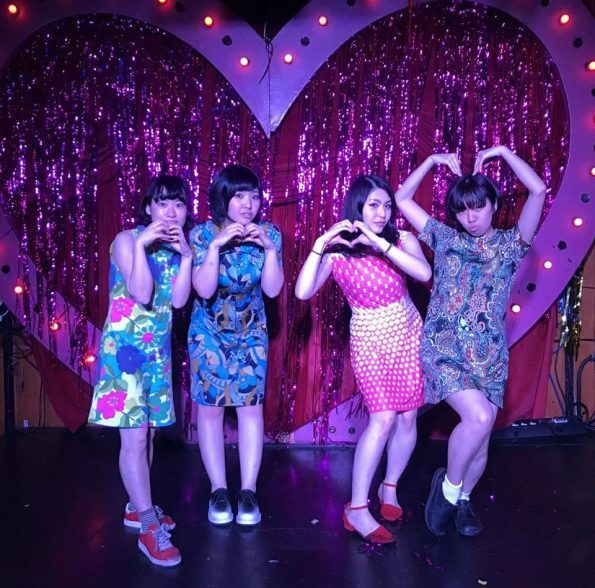 Otoboke Beaver) covered a lot of ground stylistically, Love Is Short is a three song concentrate, distilling the very essence of the quartet. Following the title cut, “Introduce Me To Your Family” skews the breakneck pace, making the closing detonation of “Mean” all the more impressive. With all the members working day jobs, touring abroad has been limited, but they’ve made inroads with a UK tour, and an appearance at this year’s SXSW turned heads stateside.